This site is designed with you in mind, the 2002 enthusiast who wants to follow vintage 2002 racing at today’s race tracks. Our goal: To be the best prepared and fastest examples of BMW 2002’s on and off the race track. 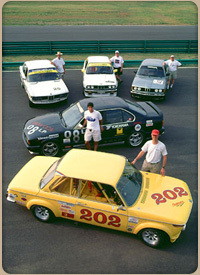 Since 1998, Skidmark Racing has been developing and racing BMW 2002’s. Racing with the BMWCCA and SVRA and HSR sanctioning bodies, we have enjoyed many successes on and off the track. We pride ourselves not only in the speed of our cars, but also in how they are presented. Over the past years we have developed various improvements to help us achieve our primary goal. This website is presented to you for not only your enjoyment, but to also follow the successes that we are enjoying. Skidmark Racing Apparel are for sale on our Products page.